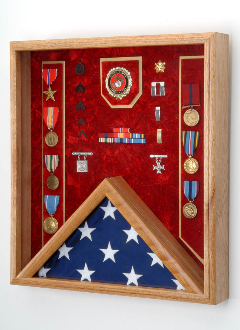 Present this Deluxe Combo Flag/Awards Shadow Box for storing and displaying those keepsakes that matter. What better way to showcase the service to a community as a firefighter than with our Fireman Flag and Medal Display Box. This special Fireman flag shadow box case can also be used a Medal Presentation Box for austere occasions such as graduation from a specialized program, awards for outstanding service, and public service anniversary recognition. The Fireman Flag and Medal Display case- Shadow Box is available in either solid oak or walnut, this Fireman Flag and Medal Display Case, Shadow Box, comes with a laminate panel back with hanger already installed. 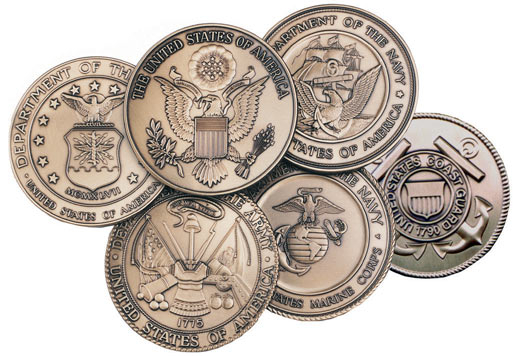 An embossed 2 1/2 inches service emblem is included with this custom flag and medal display case, with optional personalized laser engraving. This case can also be optionally ordered to accept a folded 3 ft x 5 ft folded flag. The high-quality glass front covers your keepsakes, which are housed atop a rich, crushed velvet background. This Fireman Flag and Medal Display Case Shadow Box measures 18 inches wide x 20 inches high x 3 inches deep, with raised mounting surfaces. These Fireman Flag and Medal Display case- Shadow Boxare solid red oak and walnut cases are crafted in authentic oak or walnut – we do not stain our wood to create any type of appearance. What you see is what you get, in rich red oak or walnut, and we prefer to finish it with a clear coat to enhance the beautiful grain and preserve the natural color of the wood.